Langrisser Mobile is a Japanese tactical role-playing game which featues turn based mechanics and is similar to Fire Emblem. Langrisser is based on a long-running video game series that dates back to 1981. In Langrisser you control a party of up to five heroes and the soldiers that fight alongside them. Each of the heroes has one or more skills which are either active or passive. Some of these skills have cooldowns after use, while others can be used on every turn. Combat is played on maps that are divvied up into squares and when it is time for one of your characters to act the game will display in blue all the squares it can reach and in red all the squares it is unable to during that turn. 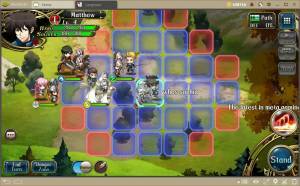 Enemies that you can attack will be denoted with a small sword icon on their square. What makes Langrisser unique form the numerous other games in its genre is that you you are able to swap any hero as they advance so their weapon type changes. You can also unlock more soldier types prior to battle which you can swap between giving you even more options. As you can see the makeup of the enemies your heroes will be facing before the battle begins you have the opportunity to tailor your force to best handle them. Each of your heroes falls into specific categories, which are divided into infantry, lancer, cavalry, fliers, demons, and light. Every type of hero is strong against one category, and weak against another one. Always check the battlefield to see if there is a chest available and if so move your hero to that square as soon as you are able to so they can grab its content. It is possible to get some great rewards from these chests. Prior to battle the game allows you to look at the enemy stats. It is important that you check them as doing so will enable you deploy heroes that are best suited to deal with the enemy. Also make sure during the actual battle you pay attention to the danger zone, healing, terrain buffs, and enemy moves. When you are playing in Time Rift mode aim on trying to complete stages with 3-stars as doing so will enable you to get instant rewards. Training will enable you to increse the stats of your soldiers. If you are struggling on a boss stage or chapter it is advised that you participate in the Aniki's GYM daily challenge where you will be tasked with obtaining training material that will take your soldiers to the next level. The following rewards can be earned by participating in the corresponding feature. Earn loads of team EXP. Earn premium-in game items; crystals, Trinity voucher. Make sure as you progress in the game you power up your team whenever possible so they are prepared to deal with whatever the enemy throws at them. This can be done the following ways. Make sure you understand how the terrain of the level affects your heroes movement speed before you get into battles. Moving a hero to favorable terrain will activate a special defense boost. You can get this over woods, cargo, mountain, ramparts, and tomb terrain. Langrisser gives you an option to set battles to Auto and let the A.I. take over your team. Although it will save time it can easily run your team into disaster. It is advised that you only let the I.A. take over when you are 100 percent sure you have the opposition outclassed. You may want to consider joining a guild as doing so will enable you to participate in the guild dungeon which will allow you to earn guild medals which can then be exchanged for rune stone and equipment. Joining a guild will also enable you to earn gold and red nuts. The rewards you receive will be in accordance of the difficulty of the guild dungeon that your leaders chose.